Le Marais is a historic neighbourhood of the 3rd arrondissement. This is reflected in its narrow mediaeval-style streets and closely packed buildings, characterised by their colourful painted wooden windows and doors. Marais is also known for its night life, especially as it is the location for the citys gay bars. If you take a stroll through the streets you can find many small, tree-lined squares. It is especially pleasant to stop here in summer for a mid-day brunch outside. There are also many small grocery shops (tea and chocolate shops are a speciality of the area) and unusual clothing stores. Rue Vieille du Temple is a well-known meeting point for young people in search of a late-afternoon aperitifs. The Muse Picasso is also in this neighbourhood. 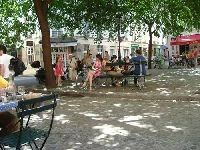 Dont miss Place des Voges with its spacious and porticos and well-kept garden. There are numeorus small and friendly restaurants and bars in the neighbourhood. The metro connections are good although the stations are on the edge of the neighbourhood so there is a bit of walk from its centre. The main downside is the noisy night life.